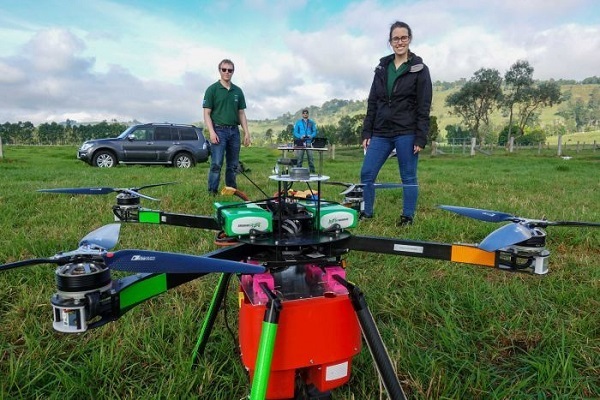 A system of using drones is being developed which could plant trees at 10 times the rate of hand planting and at 20 per cent of the cost by firing germinated seeds into the ground. A pair of operators will be able to plant nearly 100,000 trees per day, so 60 teams could get us to a billion trees a year. Obviously drones could be used in placed difficult to access manually. Earth Overshoot Day, the date when the world’s resource bank goes into overdraft was marked this year on August 2. It’s the point when the amount of natural resources — think trees, fish and water — humanity takes from the Earth reaches the total that can be regenerated over the entire year. It’s when the amount of carbon emitted reaches the amount the forests and oceans are able to absorb. 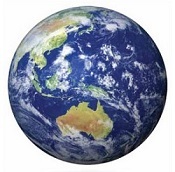 If everyone consumed the Earth’s resources like Australians overshoot day would be on March 12. “What we’ve seen in really isolated spots like Samoa for example, even though it’s very far away from [developed] countries with pollution, we struggled to find any coral life,” he said. Mr De La Brosse said nowhere was immune to the effects of global warming. the scientists argue saving the world’s reefs requires the acceptance that the reefs of the future will look very different to those of today, and humans may need to help them adapt – perhaps by intervening to increase the proportion of coral species that are tolerant to rising temperatures. So will we “deal with climate change”? 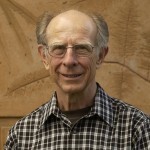 He says that coral reef literature assumes business-as-usual emissions to the end of the century, which would result in global warming of 4, 5 or 6°C. He says that we’ll start to deal seriously with climate change because Florida will go under water. 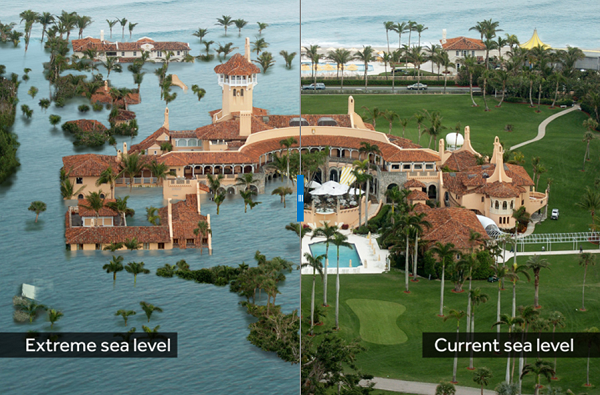 With just two feet, the estate’s western lawns would completely flood, according to the Associated Press. 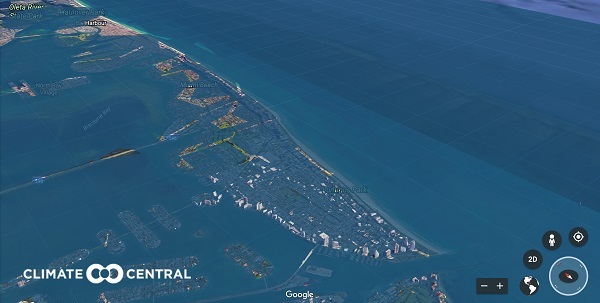 Miami Beach will begin a $US100 flood prevention project, which includes raising roads, installing pumps and water mains, and re-building sewer connections. Sooner or later the penny will drop. Meanwhile Scientists warn US coral reefs are on course to disappear within decades, including Hawaii. Volvo announced recently that all of the new cars it produces will be either all-electric or hybrid by 2019. The tipping point when EVs out-compete internal combustion engines is probably the mid-2020s. Germany is looking to ban the internal combustion engine (ICE) by 2030. They’ve announced they will put about US$1 billion towards electric vehicles with a 4,000-euro discount on electric vehicles and a 3,000-euro discount on hybrids. Norway is possibly leading the charge, with 30% of current sales being electric. Other countries are following suit, whereas the USA is heading in another direction where Trump is moving to boost oil use by 1.2 billion barrels, kill jobs and cost each car buyer $1650. Ford is teaming with DHL to build electric delivery vans in Germany. That’s according to an IMF study. By fuel type, petroleum and coal were the largest recipients of subsidies, the report found, with the China ($1.8 trillion in subsidies), the U.S. ($0.6 trillion) and Russia ($0.3 trillion) the three top subsidizers by nation. According to the authors’ reading of the data, the European Union (EU) collectively subsidizes less than half the amount that the U.S. does. The report concludes that by eliminating these subsidies altogether the world could lower its carbon emissions by 21%, reduce air pollution deaths directly attributable to the burning of fossil fuels by 55%, and raise social welfare by 2.2% of global GDP. I accidentally hit the “publish” button early. Just a bit of editing still to be done. I’ve just read in the New Scientist that a major real estate firm in the Us has recommended that people not buy in South Florida. More recommendations like that will render real estate in the area virtually worthless. That might wake people up, along with a stack of law suits if buyers were not warned. I share the distain of Governments subsidising fossil energy and more broadly any energy, it should cost what it costs. Technically speaking though, if you dig deeper, it wasn’t an IMF study and their definition of ” subsidy ” is unclear to me. Which is still 0.7% too much. Jumpy, you are right, the authors apparently work at the IMF. This paper estimates fossil fuel subsidies and the economic and environmental benefits from reforming them, focusing mostly on a broad notion of subsidies arising when consumer prices are below supply costs plus environmental costs and general consumption taxes. Pretty sketchy sort of study if subjective estimates rather than hard evidence formulates a result. But hey, there are plenty of those on every subject. The take home point is government interference is to blame, right ? To be fair, I believe they are objective estimates. Not really. It’s the fossil fuels companies’ requests for assistance that is the first cause. But you’re correct in that governments should have refused and told them to go talk to the invisible hand. Haha, if Governments didn’t have the power to dangle the carrot who would the corporates rent seekers turn to ? The first cause is the power to subsidise. Disappointed with Mr Flannery’s TV show about seaweed, and how huge oceanic farms could sequester carbon. Finished up in a Melb Uni Lecture room, with a bloke putting figures on a blackboard for Mr Flannery. The process was an old, traditional one called “pulling figures out of your Arts”. Frankly, ridiculous. Then an ecologist specialising in seaweeds cast doubt on the theory, but Mr F didn’t listen, just kept spruiking like a spin doctor. Meanwhile, hundreds of serious engineers and scientists are getting on with the hard work of designing and building things that actually work, and demonstrably lower emissions or improve energy efficiency. Catalyst ignores that and promotes a fabulist. Ambi, I think he was reasonably OK in the under-recognised uses of seaweed until he got to farming it in the open oceans, effectively deserts, by drawing up nutrients from the deep (vaguely using solar power to do it), to grow seaweed and then sink it into the deep. At that point there was no product being sold, so it was all cost in terms of dollars, and no attempt at quantification of same. Coming to think of it he didn’t go into the economic feasibility of any of his other ideas either, like making bricks from seaweed. I kept wondering whether the Gt he was talking about was C or CO2. It sounded like C but then he let slip that the whole shebang, to account for all emissions, was 53Gt, which would have been OO2. The difference is that CO2 is 3.6 time the mass of C, but he was really just throwing about big numbers in a way that was meant to impress. Also disrupting the ocean ecology with mega farms of any type is not something you would want to do lightly. Seaweed as tucker, to replace pasta, might have something going for it. Jumpy, one message I took was that fossil fuels are being sold below cost if externalities were taken into account. It’s possibly misleading to call it a ‘subsidy’, but it’s a problem nevertheless. I heard a program recently, ABC RN I think, which said that a lot of mines were not being cleaned up after the ore bodies were exhausted, leaving environments that were basically uninhabitable for humans nearby, notably in South Africa. Joining a growing list of countries — including India, France, and Norway — with similar plans to phase out fossil fuel-burning cars. Our local sushi bar sells a tiny seaweed salad that is delicious and very good value. Measure that in grams. Then there are the well-recognised industrial uses of kelp (in our region, a mainstay industry on King Island, for example). No doubt there are many more, and new products will be developed. The rest was sheer flummery. Ambi, but this is the ‘new Catalyst’ doing serious science in depth, not like the old one! * the well-informed posts by engineers, manufacturing specialists, and builders, etc. The new “C******t” has gone the way of many BBC programmes: glib, froth, fancy but irrelevant colour and movement…. Oh for the detail and knowledge of David Attenborough, and other hard working popularisers. Nonetheless, keep up the good work, Brian! But when a hypothesis is tested repeatedly with the same result it’s confirmed. Anyway, that first link about drone planting could be a boon in agriculture. If we’re planting billions of trees at least have food as a result. If we’re planting billions of trees why not the food producing type. Just looking at this thread you have contributed 7 comments (3:57 PM, 6:04 PM, 6:28 PM and 6:31 PM on August 23 and 6:02 PM, 6:15 pm and 6:18 PM on August 24). This is my 3rd. Pray tell, what is your hypothesis? I corrupted the testing by alerting the subject that they are the subject. But hey, all of you comments are directed at me, it’ s getting a little creepy. But enough of this silliness, I’m trying to stay on topic. To my mind Volvo’s new cars are essentially cars as we know them . They will still be great heavy lumps that can’t drive two abreast in a normal traffic lane and are difficult to find parking spaces for. Funny thing is that over 50% of commutes in Greater Brisbane are by driver only cars. Some of these drivers could use public or active transport but for most people in Brisbane these options are impractical for various reasons. 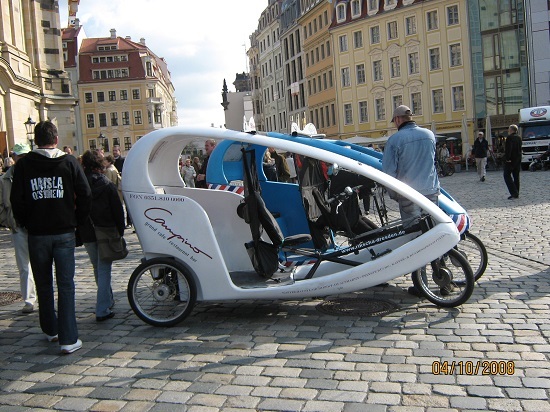 What we need to reduce peak hour congestion and energy use is to start our thinking with motor bikes and electric bicycles and ask ourselves how these vehicles can be turned into something that is safe and weather proof. Is that the kind of thing? I’m sure there would be versions now with a battery. Jumpy, in principle no reason there couldn’t be trees with something to eat. Of course, in practice there’s a bit more to horticulture than that. -Narrow enough to drive two abreast in a single traffic lane. -Carries one or two people. – Skid pan safe. Does not fall on its side when it skids. – Modern accident avoidance technology. – Does not require the wearing of protective gear. The barrier at the moment is a lack of standards and traffic rules – needs a campaign. That’s a very attractive vehicle John. If city driving was restricted to cars that size our congestion problems would reduce considerably. Don’t know what it’s like in other states, but in WA the preferred solution to peak hour congestion has been bigger roads. Maybe it’s time to give smaller vehicles a go. That’s the sad bit. Sensible policies should be adopted on their merit, without the need for a campaign. I look forward to becoming another bloody Volvo driver. Electric motorcycles will boom when they become affordable. The comfort level we are willing to forgo, the safety level is up to car drivers opening their eyes.